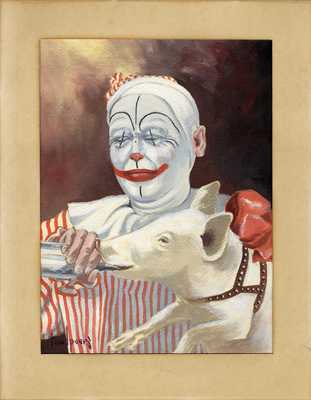 ""Yorkie" the Clown and Amelia "
A water color painting from the papers of Erskine Clifton York, circus performer and restaurant owner from Rockland and Camden Maine. The painting appears to be signed by Tom Peer or Peery. Written in pencil on the back is the phrase, "'Yorkie' and Amelia - Barnum and Bailey Circus."